When we see it in composite numbers, Republican Donald Trump is way ahead of Democrat Hillary Clinton. While writing this, Donald Trump, the US President Elect, has a combined Facebook-Twitter-Instagram following of 33.7 million that is a huge 9.5 million more than Hillary Clinton’s. Following is the split of their followers base for these three social media platforms. These figures say Donald Trump is significantly ahead of Hillary Clinton in terms of Facebook and Twitter followers – two of the three most talked about social media platforms that along with YouTube help shaping public opinion on issues – like we saw in the case of the Arab Spring – a multi-country revolution in the beginning of this decade that is attributed to social media platforms like Facebook and Twitter. He is having a slight edge even on Instagram, the junior brethren of these two. And when Donald Trump says that ‘he thinks that social media has more power than the money they (Hillary’s campaign) spent’, he makes a perfect sense. America is a connected country with firsts in telecom and internet revolutions. According to Statistica, the US has around 190 million Facebook users, 67 million Twitter users and 67 million Instagram users. That means a lot in a developed society of 320 million residents. So even if Facebook founder Mark Zuckerberg is busy clarifying that the Facebook content is authentic and just less than 1% of it can be termed fake and he is terming the ‘criticism of Facebook for spreading fake news’ as crazy, we have reasons to believe when Donald Trump says social media helped him win or when Hillary Clinton blames FBI director James Comey for her defeat who reopened the Hillary’s role into the classified emails probe days before the polls, on October 28. Okay, Hillary doesn’t say anything about social media here. But it is social media only that can shape opinion so rapidly – in a week – something that has potential to decide the electoral outcomes – at least in a connected society like the US – in a society where even many Democrats and states/regions who had voted for Barack Obama in the previous two polls, went on to vote Donald Trump – in a society that stands bitterly divided after Donald Trump’s victory – a fact that also tells us that there are very limited chances of some surge or drop in the followers base of Trump or Hillary post the election result. When it was so four years ago, imagine it now – when social media platforms have made rapid strides including new platforms like WhatsApp, Instagram and Snapchat – that are taking the world by storm. WikiLeaks has released parts of paid (in millions), private speeches of Hillary Clinton that she delivered to audiences like the Wall Street bankers. The dump is part of trove hacked from email of John Podesta, Hillary’s campaign head. These so-called speeches have always been controversial. Bernie Sanders would always reiterate his demand to make transcripts of these speeches public. Donald Trump, though fast losing the race (of popularity and of ratings) with his misogynistic, crude, sexist remarks, continues to do so. Yet Hillary refused to budge. On their part, activists were always on the job. They had already flagged some excerpts in January and a comprehensive stuff is out now. And on their part, Hillary’s team has gone on record to deny the authenticity of these papers, blaming them on Russian hackers who want to jeopardize Hillary’s electoral chances. But on her part, Hillary doesn’t look so perturbed. Even if Trump mocked her on her answer, she sounded good when she answered why a leader needed to ‘have a public and a private position’ on an issue. Yes, leaders can have public and private positions on an issue. That is only natural. That is human. Ethical politics is all about maintaining a fine balance between what you feel and what is needed. INDIA’S HANDLING OF CHINESE DISSIDENTS’ VISA ISSUE: A BOTCHED-UP AFFAIR! India has denied visa to three Chinese rights activists who were coming to India to participate in a conference that started yesterday in Dharamsala, the seat of the exiled Tibetan government in India. The four-day conference, ‘Strengthening Our Alliance to Advance the Peoples’ Dream: Freedom, Justice, Equality and Peace’, has been organized by a US based pro-democracy outfit, ‘Citizen Power for China’, led by exiled Chinese rights activist Yang Jianli, and is being attended by some 100 delegates from around the world. After the row over the visa denial issue and its global media coverage and a widespread outrage, the organizers of the conference have decided to say no to any sort of media coverage. Media has not been allowed to the venue. Participants would not talk to media about the conference. And there would be no press releases. So, in a way, nothing would come out. And that is, again a bad publicity for India, after the visa U-turn issue. Because, as reports say, the conference is being attended by many Chinese dissidents whom China would go to any extent to see behind bars or execute, i.e., Tibetans, Uighurs, Falun Gong members and Taiwanese. The same was confirmed by Dolkun Isa, a Germany based Uighur dissident from China, with whom this whole visa U-turn row began. An open media interface of the conference could have told the world that India was indeed right when it decided to cancel visa of Dolkun Isa, Lu Jinghua and Ray Wong on technical grounds and it was not under the Chinese pressure, as the message has gone, in India, and globally. Democracy is long dead in China and human rights are as flimsy as Chinese leaders’ promises for political reforms. A discussion on it in Dharamsala and its open media coverage would have helped dispel the notions that India bowed under Chinese pressure and cancelled visas. After all, it is not that no Chinese dissident is participating in the Dharamsala conference. The coverage in international media, first on India granting visa to Dolkun Isa, against whom aC China influenced Interpol Red Corner Notice is out, and then withdrawing it in the 11th hour, is a testimony to that. National and international media, which was praising India for issuing visa to Dolkun, drawing parallels with the Chinese veto in the United Nations on declaring Masood Azhar a terrorist, started mocking India when India cancelled Dolkun’s visa. Though, on its part, India said it was on technical grounds, as Isa had applied for a tourist electronic visa whereas he was coming to attend a conference that requires additional clearance from the Home Ministry, and that India had taken this decision unilaterally and there was no Chinese hand in it, the same day, China’s Ministry of Foreign Affairs issued a statement that said China indeed had approached India with its reservations on visa to Dolkun Isa. FIRST FORTUNE, NOW TIME: NARENDRA MODI’S ADVERSARIES GET SOME FODDER! Two globally accepted power-lists, published by Time and Fortune, two highly influential magazines, both from the stable of same media house – ‘Time 100: The 100 Most Influential People’ and ‘Fortune’s World’s Greatest Leaders’ – have one thing in common this year – and it will lead to many headlines and analyses, not only in India – but even in the international media. Narendra Modi is absent from both of them – while he featured on both of them last year. ‘Time 100 Most Influential People 2016′ that came out today is the 2nd list of the year after Fortune’s List of ’50 World’s Greatest Leaders’ which came out last month and featured Arvind Kejriwal, and since then Arvind Kejriwal and Aam Aadmi Party are busy taking credit for a successful first year in governance, including the much controversial ‘Odd-Even’ scheme of traffic rotation. In 2015, Narendra Modi was featured in ‘Time 100 Most Influential People 2015’ list under ‘Time 100 Leaders’ category and Barack Obama had written a piece on him titled ‘India’s Reformer-In-Chief’. His absence becomes more noticeable because the important names from the last year’s list, i.e., Barack Obama, Vladimir Putin, Xi Jinping, Hillary Clinton, and Angela Merkel, are there in this year’s list as well. 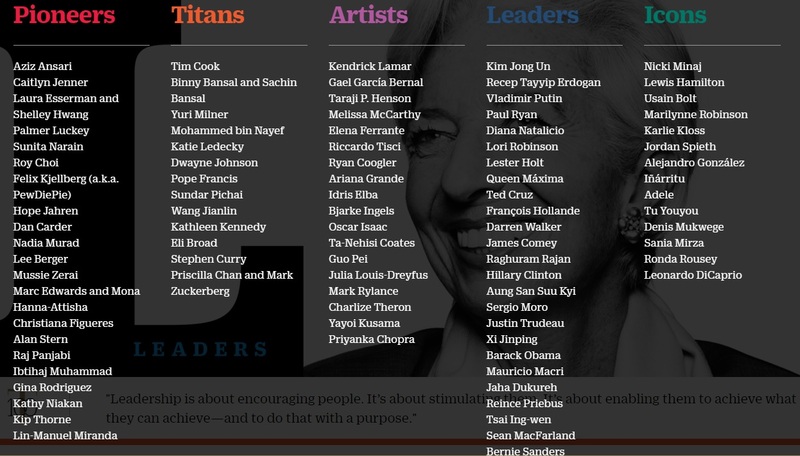 Fortune’s ‘World’s 50 Greatest Leaders’ list came out last month. It was topped by Amazon founder and CEO Jeff Bezos. Amazon’s is the pioneer and the world’s biggest retailer of the e-commerce segment and is poised to the take top spot in India. Delhi’s chief minister and Narendra Modi’s arch-rival Arvind Kejriwal is the only Indian to feature in the list (ranked at 42). That is not a big deal but it becomes important when we see that Narendra Modi was featured at quite high on this list in 2015 – at 6th spot. Okay, even Barack Obama is not there. But then, he was not there even last year. So, it many depend on the criteria for short-listing used by the magazine. But again, there are many from the last year’s list who feature in the list this year as well. Narendra Modi’s political adversaries would certainly exploit this as a fodder to munch, a trend of prime minister’s waning popularity. And it couldn’t have come at a worst time than this – today, when the Uttarakhand High Court dealt a body blow to the BJP led Union Government by setting aside the President’s Rule in Uttarakhand – using some tough and acidic remarks for the Union Government for sabotaging democratic norms – a historic decision that every democratic soul would love to see ratified by the Supreme Court when the Centre approaches there. DROUGHT – OF WATER – AND OF POLITICAL TRUST! Acts of political apathy and their cruel symbolisms continue unabated – midst a deepening crisis that has forced thousands of farmers to commit suicide – in one of the worst drought seasons – displacing millions in India internally – in 10 Indian states in North and Central India including parts of Andhra Pradesh and Telangana. And the problem is only exacerbating with the intensifying heat wave as mercury is soaring up. Heat wave has already claimed many lives in the affected regions. A case study from Beed in Maharashtra came today where a Class 5th student died while fetching water from hand-pump. According to her family members, she was helping her family to get water and had repeated trips to the hand-pump where she collapsed. Beed in Maharashtra is one of the worst drought affected districts in Maharashtra (and India). In fact, we can say it is another Latur of Maharashtra. Rather, we should say there are many Laturs in Maharashtra that need comprehensive government intervention to win over this tide of nature’s fury. But how can we take the government seriously to the extent that all will be set right henceforth – because this nature’s fury is man-made as well? And to add to the drought of political trust that we have towards our political fraternity, there are continued acts of insensitivity by some of our senior-most politicians – chief-ministers and ministers. Now, it may be true that these ministers and chief ministers may not be aware that thousands of litres of water was wasted making helipads for them or in makings roads dust-free for them but when it comes to political branding based on symbolism, no one goes into the nitty-gritty of what lies beneath. It’s all about what looks on surface. And on surface, the message that went was that the political class was not acting proactively to end people’s misery but was rather forced to act because of electoral compulsions – after Eknath Khadse (senior Maharashtra minister), Siddaramaiah (Karnataka chief minister), Akhilesh Yadav (Uttar Pradesh chief minister) and Pankaja Munde (again a senior minister from Maharashtra) were seen wasting water or exploiting their visits to drought hit areas as ‘drought tourism’. Much has been written about drought in Maharashtra and Uttar Pradesh’s Bundelkhand region with consecutive years of drought. The crisis is also deepening in Karnataka with drought now spread to as many as 19 districts of the state. The politicians should take a cue from Pankaja Munde selfie incident that was otherwise a perfectly normal human response but for a human crisis perpetrated by drought. Pankaja Munde would never have imagined the incident would be painted like this. But here it is. And so are the helipad incidents related to Eknath Khadse and Akhilesh Yadav or a dust-free road for Siddaramaiah! In the season of India’s worst drought, it may also lead to a drought of political trust among common men and it should be a clear and present danger for our political class – as every coming year this or that state assembly election or some bye-election or some local body election is due. If Eknath Khadse is emblematic of how crassly insensitive our politicians can become, can be, the row over Priyanka Vadras’ (or Priyanka Gandhi’s) house rent is equally disturbing. The only thing is, we have forgotten ‘getting disturbed’ over such ‘undemocratic developments’. Not so long ago, a senior party leader of Congress, the party of Priyanka Gandhi’s mother Sonia Gandhi and her brother Rahul Gandhi, Mr. Kapil Sibal, had taken a house in the same tony location, Jor Bagh, though certainly not as posh and VVIP as Priyanka’s house is, and less than half in size, for a whopping monthly rent of Rs. 1600,000 or Rs. 1.92 crore a year. Priyanka Gandhi pays a ‘super’ subsidized rent of just Rs. 31,300 a month for her Type VI house in Lutyens’ Delhi. The house measures 2765 sqm in size and reports say that no such big house with all its natural extensions like lawns and amenities is available for rent in the area Priyanka’s house is located. If we go by the reports of sky-high rent being paid by Kapil Sibal, the minimum that Priyanka Gandhi needs to pay as rent around Rs. 35 lakh a month. And even then, the rent cannot match house’s expanse and location. Priyanka Gandhi was given this house in 1997 at a monthly rent of around Rs. 53,000. Her request for subsidized rent was accepted in 2002 and her rent was fixed at 8,888 by the then Atal Bihari Vajpayee government. Now, the person who fixed it can only tell us about this interesting combination. The revelation here is, the loss to the public exchequer since 1997 – because even a rent of Rs. 53,000 a month for a larger than life bungalow in India’s most VVIP zone in Delhi, a city where people are cursed to live in cramped houses and flats, was a jaw-opener for anyone – for its sheer meekness. Let’s go by the simple logic – that we common folks have to shell out 10% more every year on our housing rent. That makes it roughly around Rs. 350,000 a month after these 20 years – for Priyanka’s Rs. 53,000 in 1997. Her current house rent of Rs. 31,300 is more or less in line with this ‘annual 10% hike’ norm. So, it is a direct loss to the public exchequer – running in millions – when India’s successive governments have failed to define a proper poverty line in the country – a political class that still accepts the wisdom of expert panels that find a person above poverty line if he earns Rs. 40 a day or so (Rs. 32 rural and Rs. 47 urban) – even if Rs. 40 cannot earn a decent one time meal on the prevailing market prices. Like the Bombay High Court said while hearing the petition on water wastage by BCCI on conducting IPL matches in Maharashtra – that it was criminal that BCCI was wasting hundreds of thousands of water in every IPL game when Maharashtra was facing the worst drought of 100 years, when people were not getting water to drink and bathe – this, too, is criminal when poverty, quality literacy, education and healthcare still need critical attention. How can this paltry sum be justified by anyone, let alone by the party that has been in power for some 60 years of India’s 70 sovereign years? How can Congress counter this when a simple two bedroom house less than 100 m in size in Delhi costs around Rs. 20,000 in monthly rentals and its goes up to around Rs. 50,000 or so in many upscale areas? How can Sonia Gandhi and Rahul Gandhi justify that Priyanka Gandhi indeed needs a ‘super’ subsidy for her housing rent when Robert Vadra, her millionaire husband, claims that ‘he always had enough and he didn’t need Priyanka Gandhi to enhance his life’? But nothing will move folks, except some hue and cry. It will die down soon. That is the state of affairs in Indian politics. That is the standard here. Be it BJP for Eknath Khadse or Congress for Priyanka Gandhi – the colours fade into oneness, the lines blur when it comes to ‘certain’ political compulsions. It was a BJP government in 2002 that had ‘super’ subsidized Priyanka Gandhi’s housing rent. It was a BJP government that had retained Robert Vadra on ‘no frisking VVIP list’ at the country’s airports in 2014 in spite of strong reservations. It is a BJP government in Maharashtra whose minister has made mockery of farmers’ plight by wasting precious water even if his chief minister says in the Bombay High Court that the IPL matches could be taken out of the state to save water. They are quite a lot, in our kaleidoscopic politics, be it any party, including its newest entrant, Aam Aadmi Party, though the malaise there has not reached chronic levels. In fact, if any factor that has been a constant irony in an otherwise robustly functional Indian democracy, it is about our politics, that has dragged us back, that has let us down. Yes, there have been and there are good politicians but they have always been a rare breed. Most have been – like in the category of Eknath Khadse – being parasitic on us – even if we are being forced to die – because our politicians have not been able to take us away from the pangs of an agricultural economy dependent on rains – even if we have seen almost 70 Independence Days. When Maharashtra and India are witnessing one of the worst drought years, such apathy, such callousness can only be expected from a politician. Mr. Khadse saw it unfit to take even 40 minutes of road, even if he was rushing to take credit over dead bodies. Yes, Marathwada and Vidarbha crisis is as much man-made and as it is nature inflicted. IPL was a symbolism. Its court-forced shift from Maharashtra for wasting water in maintain pitches when the state is reeling under severe drought is a lesson for everyone to get back to the business of humanism, to get sensitive to the cries of people dying, to contribute as a social obligation for your place in society. But who will tell this to our politicians, politicians with their fiefdoms who are as much a culprit as nature in forcing droughts in lives of the common men of this country. The biggest water guzzler in Maharashtra, the sugarcane industry, has names of some of the most prominent Maharashtra politicians as its barons. Yes, they employ thousands in their factories, but are they beyond this basic tenet of social behaviour – that you have to care for the survival of your fellow human-beings. In fact, it becomes all the more imperative for them to come up with alternatives to compensate for the cruel exploitation of natural resources, in this case water, in a drought year, as they are from the bunch who is entrusted with writing policy guidelines in crisis hours – like the Maharashtra drought of the these days. But our politicians have made it a habit to fail us, even if we try hard to repose our trust in them. What Mr. Khadse did was akin to mapping another level of bad politics, something that politicians like Mr. Khadse feel adept at. Books and articles have been written on how a drought is eagerly awaited by bureaucracy and politicians in India – with free flow of resources and credit to exploit. IPL’s forced shifting from Maharashtra is a defining moment for all of us and Mr. Eknath Khadse should have thought 100 times before going on his ‘helipad bravado’ that wasted some 10,000 litres of water, 10,000 litres that are lifelines for many families. He could have taken a road journey to receive the water train. Showing a bit of sensitivity would have only helped him in claiming his share of credit in this season of photo-ops, drought-politics (and water politics). But only if they care! But only if our politicians care for what we think! And as expected, intense communication packaging is on to make JP or Loknayak (a mass leader) Jayaprakash Narayan the figurehead of BJP’s or NDA’s political ‘conscience’ while campaigning for votes. As the Narendra Modi led NDA government has been on a spree to claim legacies of India’s icons like Mahatma Gandhi, Vallabhbhai Patel, Subhash Chandra Bose, Swami Vivekananda, Lal Bahadur Shastri, and even Jawahar Lal Nehru and is trying to bring many more icons in Nation’s mainstream conscious – JP was a name waiting to be picked up. 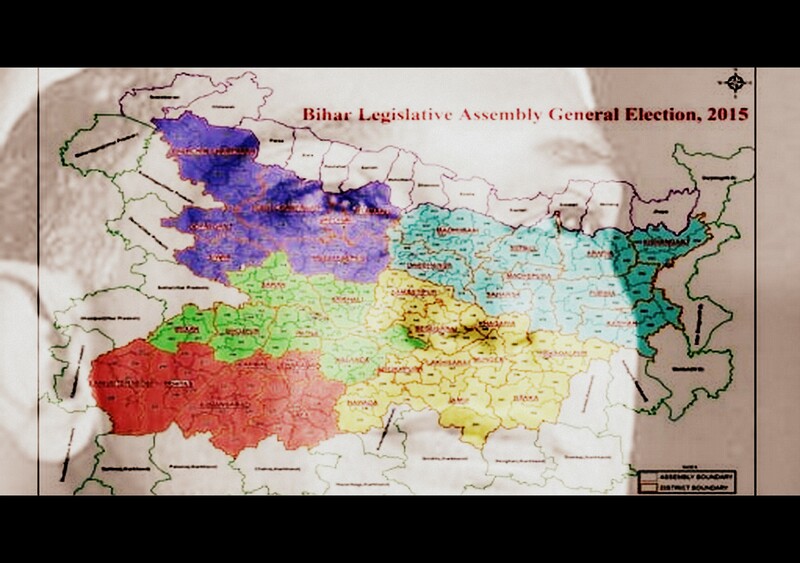 And as expected, as is the trend, no one is talking about Dr. Rajendra Prasad or Rajendra Babu, India’s first President, the great freedom fighter and one of the gems of his generation that India had – who was from Siwan district in Bihar – obviously, due to socio-political factors revolving around caste arithmetic. BHAGWAN IS ADVERTISEMENT KO SALAMAT RAKHE! Saw the Aam Aadmi Party’s (Arvind Kejriwal’s) advertisements on a ‘news channel’ today. And felt so confident after watching it that ‘the AAP and Arvind Kejriwal are on highway of success’. And it is for the betterment of the masses and the classes that they want to take it further to them, to tell them – to communicate to them the good work Mr. Kejriwal is doing – so that it reaches far and wide – so that it reaches to ‘every possible family’. After all, unlike the family in this advertisement, there are many families who don’t feel Kejriwal has done anything significant so far to affect their lives, even if there is a sea-change – at least to do while expressing themselves publicly. They are so adamant that they are not believing even Kejriwal and it is hurting the good samaritans of the ‘good samaritan sort of party’. After all, they are not doing it for name, fame and money. They are doing for social well-being. They are doing it for the ‘politics of change’ to change ‘themselves’. Therefore, it is a commendable act. I thought to do an analytical appreciation of the advertisement frame by frame but could not locate it on online platforms including YouTube and the AAP website. Hope, it will be here today, allowing me to do, what was left midway last night. India is slated to become the world’s youngest nation by 2020. The UN (UNFPA State of the World’s Population report) says 356 million (28%) of its population is in 15-24 age-group, largest in the world. Census of India says around 48% India’s population is below 21. 65% of India’s population is below 35. While writing this, India’s population is over 1.25 billion, world’s second most populous nation after China, and projected to take over China by 2050. A report by the US (Special 301 Report for 2015) says India’s internet base is projected to be of 370 million users by this year end, the second largest in the world. The report says 213 users will be using mobile internet by this June. India’s teledensity is around 100 crores (1000 million). Lowering of smartphone prices has quickened the spread of mobile internet in India, already large enough, especially among the youth and working-age population. The world’s second largest telecom network is India now. And it is projected to be the world’s fastest growing economy, overtaking the growth rate of China. 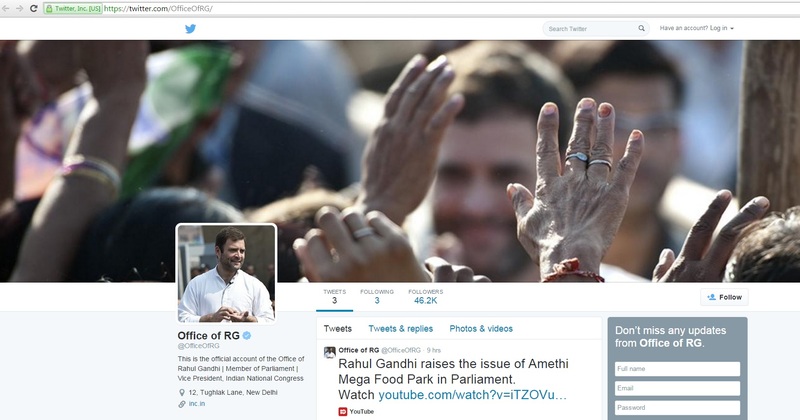 That would be in Rahul Gandhi’s mind when his office joined Twitter yesterday. But a Twitter handle @RahulGandhi or a similar one would be far better than @OfficeOfRG. It may be a personal decision by a politician who is trying to be more aggressive in national politics after returning from his leave of absence. And as he has had not any social media presence so far, he would have thought to test the waters first with @OfficeOfRG. 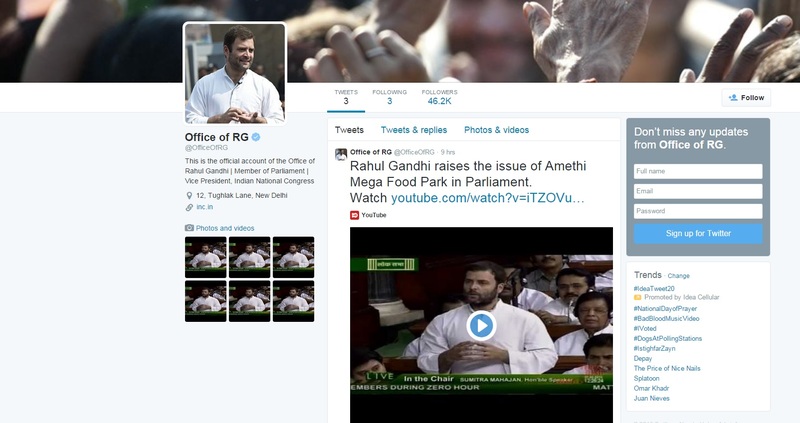 Rahul has been a favourite social media trend so far, especially for jokes. Even if not in his name, it is expected from Rahul Gandhi that he will take this initiative seriously. After all, voters, too, come from this working-age population. The lack of action so far, on day-1 and day-2 can have their own benefits of doubt and we should be ready to give that. Day-1 was about ‘waiting for Twitter authentication’ and day-2 may be about the first day of activity, with three tweets so far, with the latest one nine hours ago. Hope, the initiative will see more and robust action from day-3 onwards. If he has to take on the government, if he has to target Narendra Modi, there are more than enough issues in Indian politics to write about, to take care of. It is all about going beyond the symbolic representations this time, of a hand, of hands and of Robert Vadra.